I am so pleased to see scientific research being carried out to test the benefits of holistic therapies. To see positive results in using Reiki for pain relief is honestly not surprising, but so important and very welcome to our community. I have found that Reiki can be hugely beneficial in bringing relief to pain for both my clients and through self-healing. Reiki is a healing energy which is channelled through a healer to the healee. A person doesn’t have to believe in it to benefit, but they do have to consciously give permission and accept the energy. With Reiki, I have helped clients who have been suffering from a variety of pain to varying degrees, from migraines to chronic knee pain. Personally, I have benefited when experiencing pain from gallstones. If anyone has ever experienced gallstones or kidney stone pain before they will know how severe the pain can be. I would go as far to say I would rather go through labour again than experience the pain of gallstone!! The Reiki I gave myself helped enormously and whilst the pain did not completely disappear it took me from a crippling level of pain to a level where I was able to function and move around. 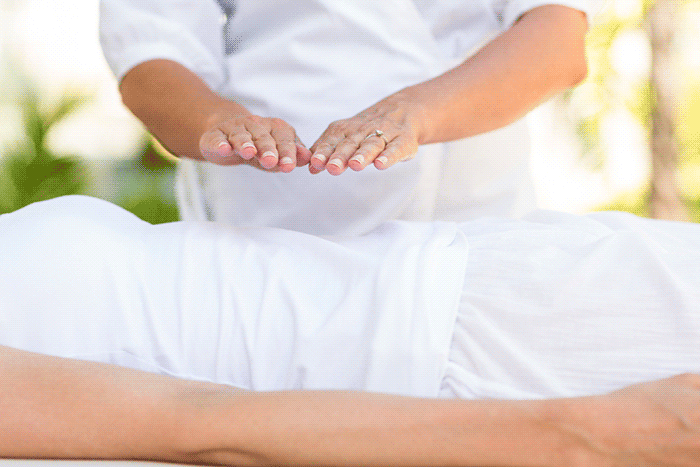 Whilst reading about individual cases of pain relief for Reiki is very helpful, having scientific evidence which demonstrates Reiki does actually help with pain relief gives patients more confidence and openness to the Reiki therapy. The Center for Reiki Research is doing excellent work at looking at the benefits of Reiki treatment which is fantastic for Reiki practitioners but more importantly for the people who can benefit from receiving Reiki. One study which looked at the effects of Reiki when applied to the incision area of patients who had a cesarean section. 3 Groups were tested Group 1 received the Reiki, Group 2 hands on the body but without any Reiki given, Group 3 Did not receive any hands on. The results of the study showed that Group 1 the Reiki group had significantly less pain and the requirement for painkillers than Group 2 & 3. There was not any difference between Group 2 & 3 in the requirement for pain relief and levels of pain.